LinkedIn has announced a $175 million acquisition of B2B solutions company Bizo, a San Francisco technology start-up specialising in measurable display and social advertising programs. The partnership will integrate Bizo’s marketing services with LinkedIn advertising and content marketing products, targeting its network of more than 300 million members worldwide. “(It) will enable us to become the most effective platform for B2B marketers to engage professionals,” Deep Nishar, LinkedIn’s senior vice president of product and user experience said. Bizo targets prospects within professional segments and nurtures them at every stage of the sales and marketing funnel. Proprietary data management and targeting technology enables precise and measurable multi-channel marketing programs. The company was started in 2008 by Russell Glass, Bryan Burdick, Donnie Flood, Mark Dye, Lee Byrne and Yonatan Stern. LinkedIn vice president of product David Thacker wrote in a blog that the company would acquire Bizo’s media solutions and multi-channel nurturing products but not its data solutions business. 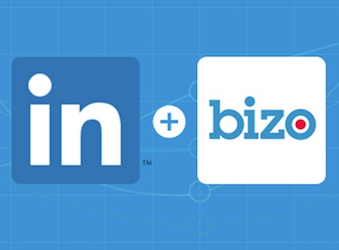 The Bizo technology would help LinkedIn build its fast-growing sponsored updates program introduced last year. “We believe the talent, products, and technology they bring will enhance our ability to offer a comprehensive B2B marketing platform for brands,” Thacker wrote. Bizo chief executive officer Russell Glass wrote in a blog that the two companies’ missions were well-aligned; LinkedIn’s to connect the world’s professionals to make them more productive and successful, and Bizo’s to help B2B marketers get to the right people. “We have been a LinkedIn partner for a while now, and when we started to develop that relationship a few years ago, it became readily apparent that we shared very strong and positive employee cultures, and that we both had a similar way of thinking about building out our respective businesses, with core customer-first and member-first mindsets. “When we started Bizo just over six years ago, our goal was to build an unbeatable team, culture and product to help B2B marketers drive greater revenue and results. We have come a long way towards delivering against this vision and at the same time see a huge amount of opportunity ahead of us,” Glass wrote.